Several new ships and boats would be purchased to strengthen the Navy to fight the drug menace more effectively, Defence State Minister Ruwan Wijewardene said in Parliament yesterday. Wijeradene was participating in the Committee Stage Debate of the budget 2019 on Expenditure Heads of Defence Ministry and Mahaweli Development and Environment Ministry. He said the Navy had received two vessels from India and the US has come forward to give Sri Lanka a cutter aircraft which is expected within the next few months. “China is to give the Navy another vessel. Japan will give us two more boats to strengthen the Coast Guard Department which will enable us to step up the fight against drugs,” he said. “The President with the assistance of the government has launched several successful programs to eradicate illegal narcotics from the country. We have received many reports that these drugs are mainly coming into the country through sea routes. To fight with this, we should strengthen our Navy,” he said. The Navy and Coast Guards will use more petrol craft against drug smuggling. The Navy is building small petrol boats and we have also supplied small boats to the Seychelles. When we receive allocations by 2020, we will manufacture 17 foot vessels in Sri Lanka,” the State Minister said. “It is when the security forces is strengthened that we would be better prepared to face any war in the future. The Defence Ministry also needs more funds to shift the military bases in to release lands in the North,” he said responding to a question raised by MP Shivashakthi Anandan. UPFA MP Nimal Siripala de Silva lauded the President for the initiatives taken to address the drug issue and eradicate the drug menace which is affecting the youth in the country. 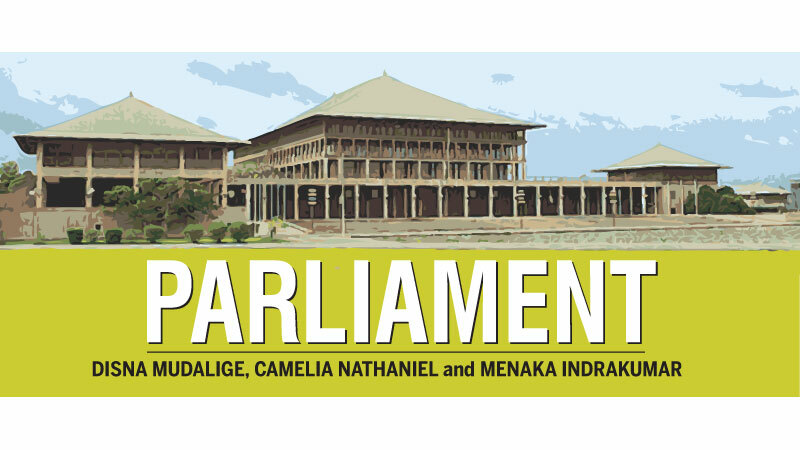 He was participating in the committee stage debate in Parliament yesterday when the expenditure heads of the Defence Ministry and the Mahaweli Development and Environment Ministry were taken up for debate. “Our President has very creatively planned the campaign against drugs which is a timely need. Together with the police, the tri forces and with the people and the country’s leaders a pledge was taken on Wednesday to work together to fight the drug menace. This programme has succeeded in making many attitudinal changes against drugs. He said the President had taken every effort both locally and internationally to ensure national security is safeguarded. “I commend the President for being steadfast in his stand at the UNHRC and for letting the world know our stand through the Foreign Minister Tilak Marapana. It is the responsibility of all of us to protect the self-respect and integrity of our police and tri forces members. It is through this self-esteem that they get the strength and courage to carry on their duties. It is this integrity and self-esteem that helps them in boldly serving the country, even at the cost of their lives. We should have the political leadership that would protect these war heroes and safeguard their integrity against the diaspora elements who try to discredit them by war crime allegations,” he said. Speaker Karu Jayasuriya met the members of the newly set up Office for Reparations in Parliament yesterday. On the recommendation of the Constitutional Council, President Maithripala Sirisena has appointed former Ministry Secretary Dhara Wijayatilake as the Chairperson of the Office for Reparations. The other members of the Office for Reparations are retired Lieutenant Colonel W. W. Rathnapriya Bandu, Dr. J, M, Swaminathan, Sellathambi Sumithra and A. A. M. Faththeeu. The appointments are effective April 1. The Speaker opined that the Office for Reparations would play a major role in accountability. It is the second official mechanism set up to deal with missing persons issue and post-war allegations. It provides for individual and collective reparations for the family members of missing persons and those who suffered a violation of human rights. The scope of new institution applies to the conflict in the North and the East as well as “any political unrest or civil disturbance, systematic gross violations of the rights of individuals, groups or communities of people of Sri Lanka, and enforced disappearances”. The legislation to set up the Office for Reparations was passed in Parliament in October last year. TNA MP M.A. Sunamthiran said that if the President is serious about reconciliation and he really means what he says, the issues under defence, accountability related, Mahaweli and environment must be reversed and a new attitude must be displayed. He was participating in the Committee Stage debate when the expenditure heads of the Defence Ministry and the Mahaweli Development and Environment Ministry were taken up for debate in Parliament yesterday. “We thought you had come to office with a new attitude in 2015 and for a while you demonstrated that, but now with the passage of four years, serious doubts have entered the minds of the Tamil people because one thing is said but quite another is done,” he said. He said the defence expense ought not to be this big as there is no war now in the country. “Recurrent expenditure is there but if proper demobilisation and demilitarisation had been done in keeping with the actual needs of the country, this colossal allocation need not be made,” he said. He said they have been in discussion with Defence Ministry officials and the Minister of Defence himself with regard to lands that were taken over by the security forces at the conclusion of the war. He, however, acknowledged that a fair amount of land has been released. “After 10 long years, still many lands are held by the Army, Navy and the Air Force. The Police are also occupying some private properties and still not handed them back. We ask for an expedited process to hand these lands back. The people have been demonstrating for around four years in Keppapilavu and various other places. These lands are not crucial for national security, but these agencies are slow in returning these lands back to the people. They claim that they have returned over 90 per cent of lands to private ownership. That is not true. We asked to ascertain these details. We have not been given the lands yet,” he said. Sumanthiran said that categorising of private lands is not satisfactory and that the people have lived on these lands earlier. He said that 10 years after the end of the war, there is no process of accountability. There is discussion with regard to local or foreign judges. “I want to ask the government, even with local judges, what have you done in terms of accountability? Your own LLRC report says 3,022 persons surrendered to the Sri Lanka Army after the war ended or during the last few days. That is your own commission report. But has there been even one entirely local investigation into that matter? No. So drawing a red herring and emotive speeches saying we will not allow foreign judges to come, gets you nowhere because you have not done even a local process,” he said. The Committee on Public Enterprises (COPE) has instructed the SriLankan Airlines management to come up with a new action plan by June 6 without depending on foreign consultancy firms. The management of the SriLankan was summoned before the COPE on Wednesday. Former Chairmen Nishantha Wickremasinghe and Suren Ratwatte and former CEO Kapila Chandrasena were also summoned but only Suren Ratwatte turned up for the meeting. “From 2010-2019 there had been five restructure plans for SriLankan Airlines prepared by international aviation consultants Nyras, Seabury and Seaworks. The national carrier had spent millions of rupees on them. As at now, SriLankan is running at a loss and its net assets are negative. It has issued a USD 175 million international bond in 2014 and it matures in June 2019, but the company has no means to pay it back with interests. Added to this, it has taken a credit package of USD 125 million from the Credit Suisse Bank in 2017/2018 keeping air ticket sales income as guaranty. We watch the performances of the management with positive thoughts as they seem to be putting a genuine effort to turn around the national carrier. We asked them to provide an example by curtailing unnecessary expenditure,” a COPE member said. The COPE meeting was headed by its Chairman Sunil Handunnetti. Opposition leader Mahinda Rajapaksa yesterday in Parliament said the government has not taken any action to find a solution for the illegal micro finance lending and discourage those with it. He said the Mirco Finance projects are established in rural areas and the loans schemes of them are ruining families. “A small group of people lend money especially during emergencies. Many such organizations have approached rural people recently and made this lending a profit-making venture,” he said. “The government has stated that the public must repay the loans, and there is an issue as some of these companies cannot be identified. The situation is getting worse, and many rural people now are heavily indebted,” he said. “Along with loans come attachments and later threats. These activities are carried out by underworlds groups. This destabilises the economy of the people,” Rajapaksa said. Many rural people do not have what banks need for them to grant loans. Therefore, they pawn their jewellery items and other valuable assets that they will not be able to redeem later. This illegal credit system is carried out by the underworld and it should be discontinued. The government should must start suitable lending programmes from the grass roots levels and develop the rural economy, he said. Labour and Trade Union Relations Non-Cabinet Minister Ravindra Samaraweera yesterday in Parliament said that frequent protests where the protesters block the roads leading to heavy traffic congestion have become a grave nuisance to the public and requested authorities to notify a place for protests. He was participating in the Committee Stage debate of the budget when the Expenditure Heads of Defence Ministry and Mahaweli Development and Environment Ministry were taken up. “Staging protests has become a modern fashion where many protesters deliberately want to get beaten by the Police to get attention. The best solution for this problem is notifying a specific place for public protests. Somewhere close to roads would be fine too. It has become a habit for protesters to block the Parliament Road. Parliamentarians can avoid them somehow because we have certain privileges, but the people have to suffer,” he said. Chief Opposition Whip and UPFA MP Mahinda Amaraweera said they support giving separate places to stage public protests and that it is a need of the hour. He, however, said the people would not come to streets if they are allowed to meet ministers and officials to present their grievances. The resignation of all five renowned environmentalists appointed as Directors to the Project Office of the World Wildlife Conference 2019 (CITES CoP18) was questioned by JVP MP Bimal Rathnayake in Parliament yesterday. He was speaking at the Committee Stage of the Budget debate when the Expenditure Heads of the Environment and Mahaweli Development Ministry and Defence Ministry were taken up. The MP said the International Conference to be held in Colombo from May 23 to June 3 is at a risk of suspension if the prevailing disputes were not resolved soon. The MP requested the President to step into resolve the disputes to avoid a black mark to the country. He said that well-known environmentalists Dr. Sevvandi Jayakody, Upul Kulasinghe, Samantha Gunasekara, Dhanushka Abeykoon and Daniel Fernando had collectively sent a letter to the Tourism Development, Wildlife and Christian Religious Affairs Ministry Secretary on March 19 informing the reasons for their resignations. The MP, tabling the letter, told President Maithripala Sirisena, who was present in the Chamber, to summon the five officials to inquire into their problems. The MP said the resigned officials have complained that the undue interferences of the Ministry and outside parties have put the management in chaos. “This is an international event in which about 3,000 foreign delegates are expected. The total participants will exceed 5,000. The President is the Chief Guest and the CITES Secretary-General will be in Sri Lanka. This is not an event one should meddle in seeking undue financial benefits from hotels and transport. The officials in their letter have stated that there is a reason to believe that hotel rates for the delegates are being manipulated for personal benefit. They would not make unfounded statements,” MP Rathnayake said. Citing the letter, the MP pointed out that the officials have also complained of “unilateral scheduling of meetings without following established procedures, the minimal communication between one new appointee and existing staff resulting in duplication of work and no clear lines of delegation leading to inefficiency and degeneration of staff morale, appointments to posts without following standard procedure, wholesale change of scope of activities without discussion and attempts to alter constructions that have been deemed necessary by national experts”. “A new Director General has been appointed without Cabinet approval and was sent to Geneva. These officials were appointed by Cabinet and now decisions are made side-lining them,” MP Rathnayake said. The Committee on Public Accounts (COPA) in its latest report highlighted several key findings related to imported milk and milk products, imported fruits, canned fish and types of meat available in the market. The report containing observations on public institutions summoned before the committee from February to October last year was presented by COPA Chairman Lasantha Alagiyawanna in Parliament yesterday. The Auditor General’s special report on the intervention of Government Institutions regarding Importation of Quality Foods had been discussed in detail in the COPA report. “It was revealed before the committee that there are issues regarding the standard of types of meat and meat related products available in the market since it is not mandatory to obtain the standard certificate issued by the Sri Lanka Standards Institute,” the report observed. “The Health Ministry stated that regulations are prepared for meat and meat related products by a sub-committee on food. It said regulations on labelling of food items, milk and milk related products, food preservatives, bottled water, iodinated water and food additives have been prepared and forwarded to the Legal Draftsman. The Committee decided to inform the Legal Draftsman to prioritise drafting of those regulations,” the report added. The COPA had also ordered the Health Ministry Secretary to submit a report on sediment components of banned pesticides found in imported fruits such as apples, grapes and oranges and the measures taken in that regard. This was after the Government Analyst’s Department found pesticides banned in Sri Lanka in each sample of the imported fruits sent by the Health Ministry for tests. Finance and Mass Media State Minister Eran Wickramaratne in Parliament yesterday requested Timber Corporation officials to standardise the prices of timber for the benefit of the traders of furniture. “I want to take up this issue with the Timber Corporation. I applaud the Corporation for its work, but this issue should be considered. The prices of timber should not fluctuate to ease the burden of the traders,” he said. He said the trade was established many years ago and now its stakeholders undergo many hardships. “Many small-time business owners are in the trade and they should be protected. The Timber Corporation should help aspiring carpenters. They should be encouraged and guided properly. Keeping Moratuwa as the hub, the furniture trade should be developed and traders should be helped. I ask for professional guidance for the traders at present for those in the future to have better knowledge of the trade,” he said. UNP MP Hesha Withanage and Mahaweli Development and Environment State Minister Ajith Mannapperuma locked horns in Parliament yesterday over the issue of dumping garbage close to the Embilipitiya Chandrikawewa. During the round of questions for oral answers, Withanage asked the Minister whether he was aware that the Chandrikawewa is polluted with the garbage being washed into the lake. State Minister Mannaperuma said that around 35,000 families get water from the Chandrikawewa for drinking and 10,896 families use its water for farming. He denied that the Chandrikawewa was polluted with refuse from the Embilipitiya weekly fair mixing with the water in the lake. “You were the Chairman of the Embilipitiya Pradeshiya Sabha, so you should know if garbage is dumped into the Chandrikawewa. Perhaps you are also responsible for it,” he told MP Withanage. An agitated Withanage retorted, “Did the officer who supplied you these answers even check the lake before giving you this report? Don’t give foolish answers. If I dumped the dirt in the lake, would I ask this question? I did not ask you who dumped dirt into the lake. We asked the government for money for years to resolve this issue to no avail. The Speaker intervened and asked the State Minister to look into this matter more closely and report to Parliament.